The different apartments (5-pers. NL-1131-01, 6-pers. NL-1131-02 en 7-pers. 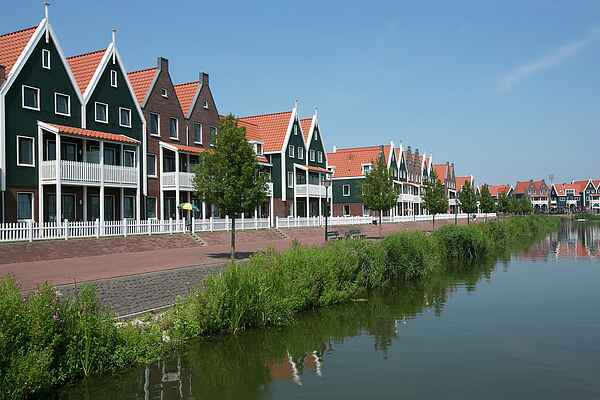 NL-1131-03) built in 2007, are spread throughout the park in "Grachtenpanden" (row houses). The apartments are situated on the ground floor or the first floor and are completely, modern and comfortably furnished. Some of them contains two or three floors. The apartments are all different. You dispose of a terrace or a balcony with garden furniture. Parking is near the property. All apartments have a view over the Ijsselmeer or the surrounding area. A fantastic location to enjoy the beauty that this area offers.